Nice slipper! Very well made. Just got them, they are a bit snug but most likely will stretch as soon as I wear them a bit more. Very pretty - I got the blue. I would not recommend this product, although they appear to be soft and plush they are not. You get what you pay for, I would of preferred to pay a little bit more to get better quality!! I never buy another pair of slippers on Overstock.com again. I bought two pairs of this item. They were given as gifts. One of the receivers said that the shoes were comfortable, but they wore out too soon around the heel part of the shoe. These slippers are very cute and super comfy. They are soft and have a foamy texture each time you step. I bought the blue and they seem to get dirty quickly- I haven't yet tried to wash them. NIce slipper for the price. 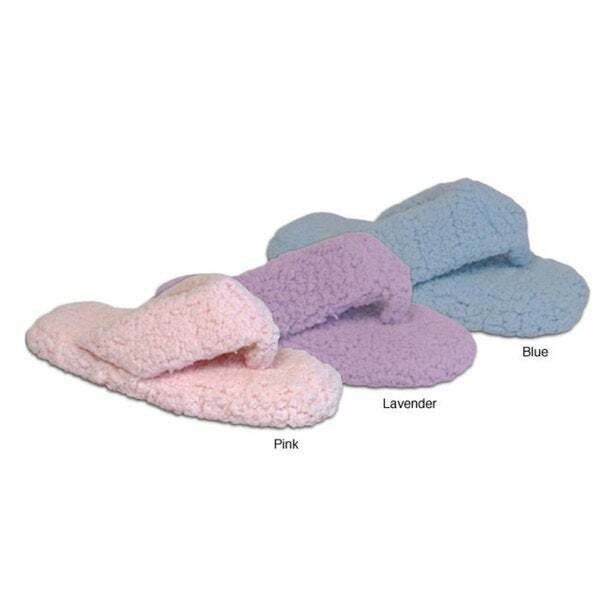 These slippers are so soft and comfortable to wear! I wish I could wear them to the office. These slippers are so soft and the memory foam filling is great. The only drawback is they don't have much arch support. Otherwise GREAT!!! Soooo nice. Love them. Finally found a slipper cushy and comfy. These will feel so good after a day on your feet. I've purchased similar slippers for more than half the cost that lasted 100x longer than these! The seem in the front fell apart almost immediately and cheep foam came out...real disappointment. Had to toss. Suggest you spend your money elsewhere.